The Vitascan system was an early color television camera system developed by DuMont Laboratories. Development began in 1949 and the product was released on an experimental basis in 1956. Vitascan cameras only worked indoors, due to Vitascan being in essence a flying-spot scanner based system. Normally, with a flying-spot scanned system, the whole studio would have to be completely darkened, in order to prevent any other light from interfering with the photomultiplier tubes. To avoid darkening, strobe lighting was used in the studio for the aid of the talent. 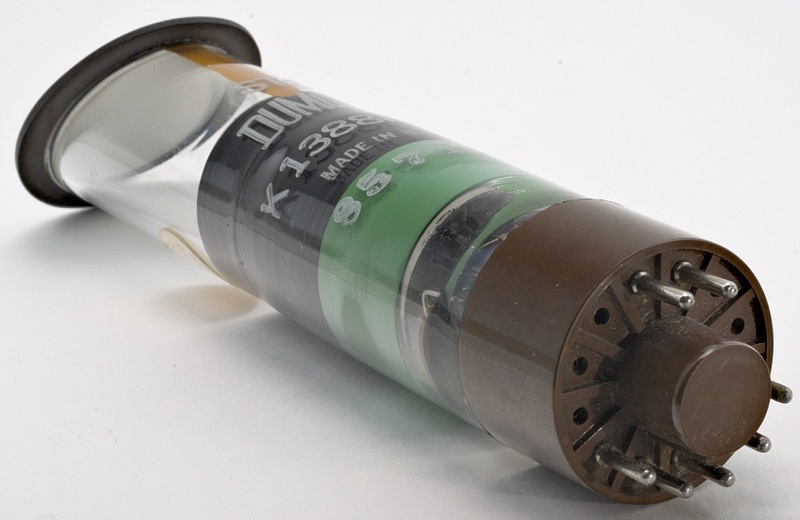 The strobe light, referred to as a “Sync-Lite” by DuMont, would light up only when the photomultiplier scoops were in the vertical blanking intervals of the video they would generate, to prevent any light interference to the photomultiplier tubes. Two different methods of lighting were developed. The first method utilized miniature Xenon flash lamps and the second method small, short-persistence cathode-ray tubes. 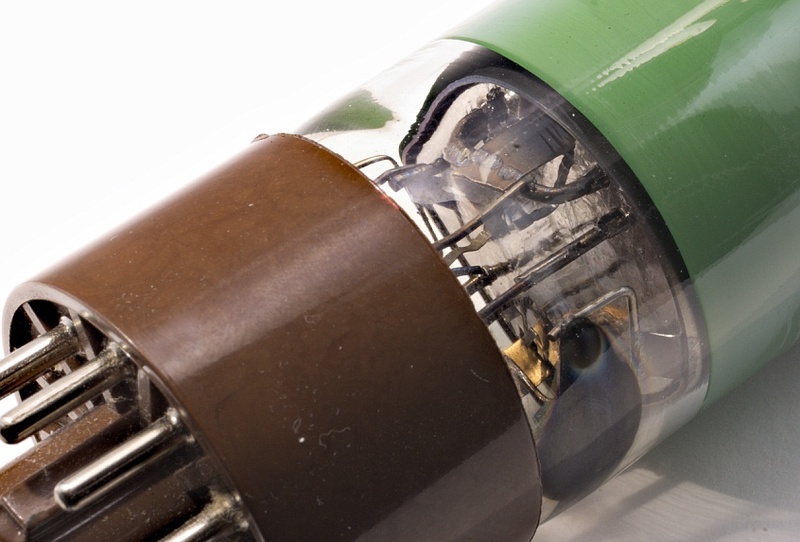 The K1388 consists of a 1½" diameter glass envelope with a special triode gun at one end and a metal phosphor plate, inclined at 45°, welded to the other end. 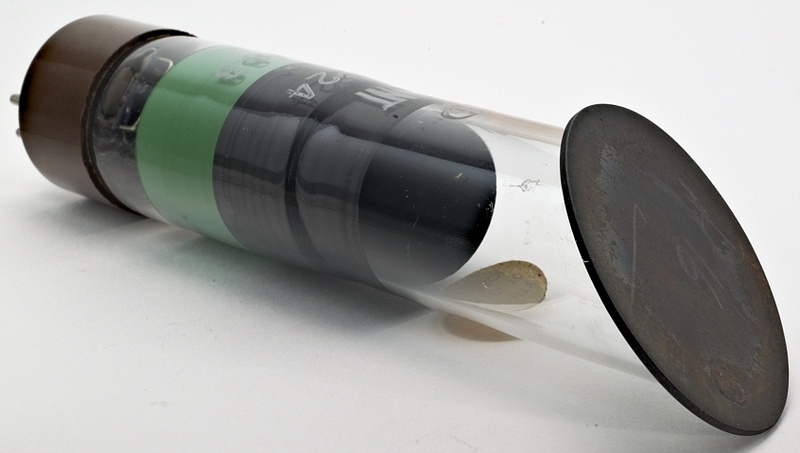 This method of construction gives a three times improvement in light output over conventional tube construction by enabling the phosphor to be efficiently air-cooled. The special gun is designed to produce an unfocused flood of electrons over the phosphor surface, typical operating figures being 15 kV accelerating voltage at 200 μA average current. The short persistence phosphor is a zinc oxide, zinc activated phosphor with a decay of 1μs, having high efficiency and considerable resistance to burning under electron bombardment. From 1956 to 1959, Vitascan cameras were in use at independent television station WITI in Milwaukee, Wisconsin, for its local TV news programs. However, the limitations of the cameras caused WITI to eventually return to monochrome cameras. The television industry never adopted Vitascan. Thanks to Charles Osborne for his help in acquiring this tube, and for identifying it and providing documentation. Experimental light fixture utilizing three K1388 tubes. 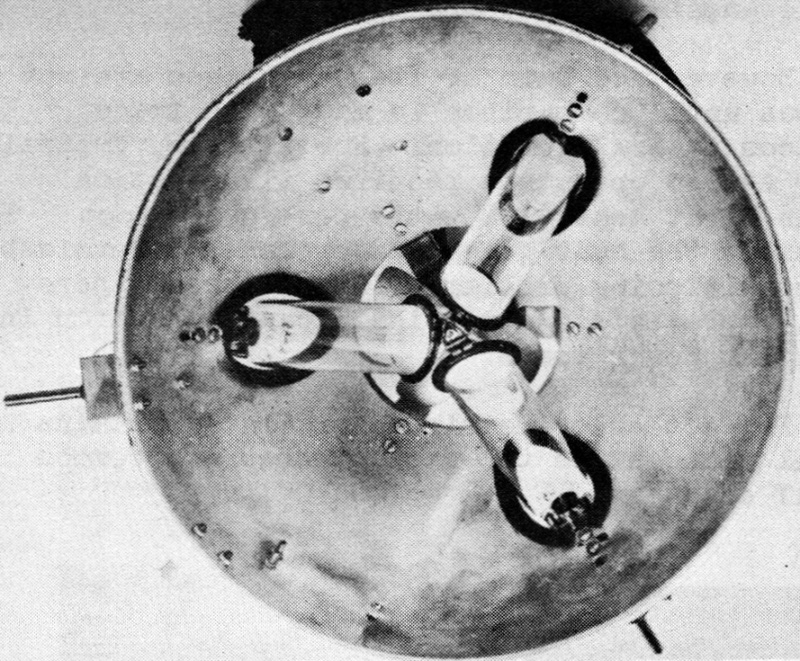 It consists of an aluminum reflector housing into which the cathode-ray tubes are inserted with their metal phosphor plates uppermost. This enables efficient cooling to be obtained by a small fan mounted above the tubes at the top of the reflector.